While the Western drought has its claws firmly dug in, the nearly five-year drought that has gripped Oklahoma and Texas is on its last legs, thanks to recent torrents of rain, government climate scientists said Thursday. The last vestiges will likely disappear over the next few months as forecasters with the National Oceanic and Atmospheric Administration (NOAA) expect the summer to bring increased odds for above-normal precipitation to a swath of the country from the Intermountain West down through the Plains and through parts of the Southeast. The NOAA summer outlook also expects the uptick in soil moisture in the Southern Plains to help keep temperatures down, though the country’s coasts won’t be so lucky. The entire West up to Alaska, as well as parts of the East Coast are likely to see above-normal temperatures from June through August. The expected temperature and precipitation patterns are “fairly typical of El Niño summers,” David Unger, a seasonal forecaster with NOAA's Climate Prediction Center, said. 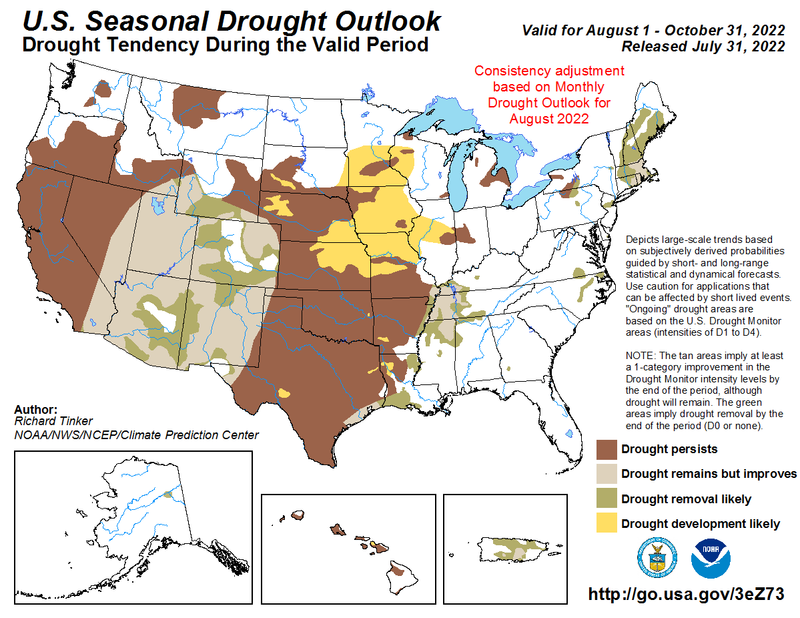 The drought that hit Texas and Oklahoma began in 2010 with months upon months of hot, dry weather. It reached its nadir in 2011 when the entire area of both states was mired in drought. In October of that year, nearly three quarters of Texas and 60 percent of Oklahoma was in exceptional drought, the worst category recognized by the U.S. Drought Monitor. Both states have seen fits and starts of improvement since that low point, but it is the rains over the past few weeks that have sounded the drought’s death knell. 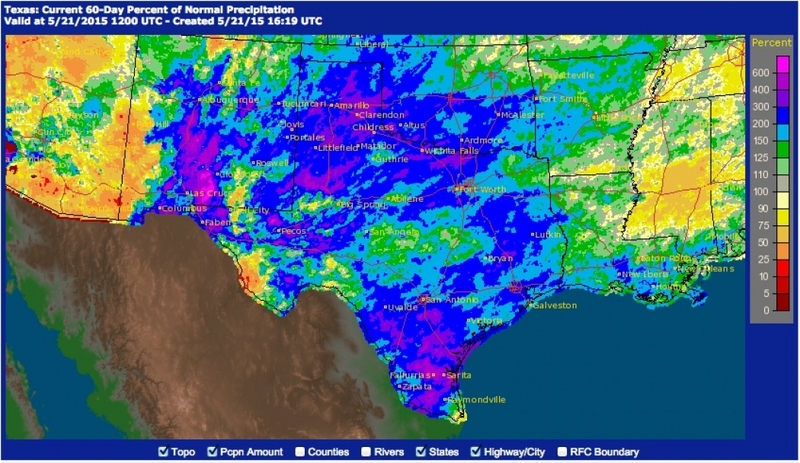 Most areas of Texas have seen more than 200 percent of their normal precipitation over the past 60 days, recharging reservoirs and bringing moisture back into baked soils. The rains brought more than 3 trillion gallons of water into Texas reservoirs, Murphy said, most of which are nearly completely full, though some are still struggling. The amount of rain Texas and Oklahoma have recorded over the past 60 days (as a percent of normal). “The rain’s been widespread; the improvement’s been widespread,” he said. And though residents may be getting a bit weary of rainy, stormy days — heavy rains in such short periods can bring threats of flooding — they look to be in for more of them. Forecast models suggest that the odds favor the Southern Plains seeing more above-average precipitation throughout the summer. Those odds extend from parts of Idaho and Montana, down through the Plains states, and over across much of the Gulf Coast states. That kind of precipitation pattern has been seen in many other El Niño summers, as this one is expected to be, with forecasters 90 percent certain the El Niño currently in place will last through the season. El Niño is a cyclical climate event that features warmer-than-normal surface waters in the tropical Pacific Ocean. The heat the ocean gives off alters the normal weather patterns over the region, which can then affect weather in other parts of the world. 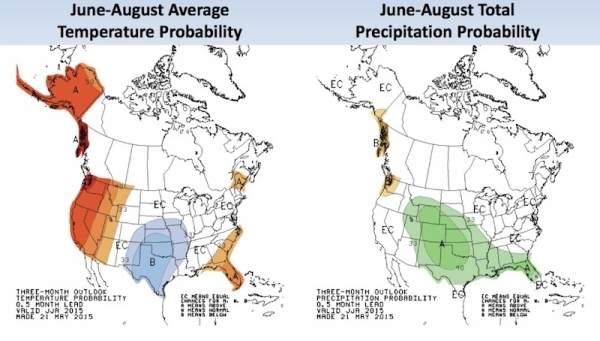 Expected summer temperature and precipitation patterns across the U.S. While the climate signals that forecasters have to go on don’t give much indication of what most of the rest of the country might expect precipitation-wise, they do suggest that coastal Pacific Northwest will see below-normal rains. That, combined with expected above-average temperatures, is likely to exacerbate the region’s “wet drought,” brought on by a lack of snowfall over the winter. The northwest coast fared better than inland areas in the winter, as it depends more on rain than snow to fill reservoirs, but NOAA expects drought to develop there over the summer. The odds for warmer summer temperatures extend to varying degrees across the entire West, and won’t help the drought entrenched in California and other states, either. Scorching summer heat can increase water demand, and California has already had to introduce mandatory water restrictions statewide for the first time in its history. So while one drought, in Murphy’s words, “looks like it’s pretty much on it’s last breath,” another could be set to dig in even deeper.